musical play with themes of inclusion of others, caring, antibullying, respect of others, self esteem, making a difference one by one. Uplifting,empowering, educational yet fun. Opportunities to teach values. Won Kidlutions national award. 2. Scene III: That's Life, and Baseball! 8. Act III: Kids Take Action-Let's Do It! I believe in teaching children character building values of including others who are different from us yet realizing everyone breathes, bleeds and smiles the same: teaching caring, empathy, respect, antibullying, self esteem, making a difference through small acts of kindness. 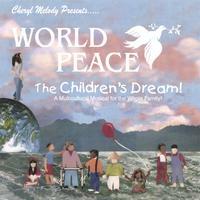 CDs- World Peace The Children's Dream CD, (national Kidlutions Award)- Friends Forever (Grammy Nominee) and Celebrate! (National Kidlutions Award) all address these values. Meaningful words within every song and story. These CDs can be the jumpstart to discussing these important human values of caring for each other. I also developed a 3 act musical play for older kids to perform, called Peace Begins with You and Me and can be ordered through me on www.cherylmelody.com. I am a singer, composer, author, playwright, poet, voiceover artist, educator and sound healer. Thank you for your support of this independent artist. I have done this work of love for over thirty years.